Properties in Harz District average 4.5 out of 5 stars. FH Am Hexenstieg - Holiday House "Am Hexenstieg"
Property 3: FH Am Hexenstieg - Holiday House "Am Hexenstieg"
Property 14: Apartment - Apartment "Alte Linde"
Apartment "Unger" - Apartment "Unger"
Property 27: Apartment "Unger" - Apartment "Unger"
Property 33: Relaxing days on resin - be welcome! Apartment in the Harz in a quiet location with many excursion opportunities. Property 37: Apartment in the Harz in a quiet location with many excursion opportunities. A cosy and family-friendly apartment in the centre of Bad Suderode in the Harz region. 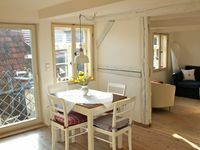 Property 44: A cosy and family-friendly apartment in the centre of Bad Suderode in the Harz region. Simone did such a good job of explaining everything to us. They were also SO nice, by letting us store our luggage on site even after check out, since we had a late train on Sunday. This place is SO close to the Hbf and such a nice and comfortable place to stay. It accommodated our group of 10 with ease! We would definitely come back to the Villa is we were to return to Quedlinburg. The apartment owners were great to communicate with, and getting in to the apartment was easily arranged over the phone. Parking, for example, turned out to be not a problem as there is a secure space for guests that is very near by. The apartment is very much like what is shown in the photos. It is not huge, but it was very suitable for my family of four. The apartment, though in a 600+ year old house, is very modern while retaining elements of the old house which can be seen in the photos. The apartment is also quiet. The kitchen is small but very well-equipped. The location is also great. There is a grocery store just across the street, a butcher just down the street, and a very nice bakery down the street and around the corner. There is a farmers market on the square once per week (Wednesday). The main square is a short walk down the street and all major attractions in the town are within easy walking distance. 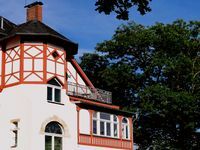 We would have enjoyed staying longer than we did, so we could have visited the Harz Mountains and some of the surrounding towns but that will have to be on a different trip. Quedlinburg is a beautiful town. I would definitely stay here again.